For many small business owners, the creative aspects of running your own business come easy. If you’re a soapmaker, choosing the ingredients, design, color and fragrance of products is fun! But after your products are created, it’s time to sell. This is when small business owners must decide how much to charge for the product, and that can be a little confusing. It’s important to understand there is no black and white guide to pricing your products. Every business owner will price their products differently depending on a number of factors, including the distribution model, fixed costs, raw materials, labor and more. Before we dive into it, keep in mind these numbers are very simple and are meant to give you a place to start. In business, there are many small costs and things to consider that are unique to you. These numbers may also seem unrealistic for your situation; your costs may be much higher or lower. Adjust the numbers in the examples to fit your costs. For example, the overhead costs of a soap storefront in Seattle will be much higher than a soaper selling their products via Etsy. Click here to learn more about where to sell your products. To help make the process of tracking your costs a little easier, download this free Pricing Your Soap Worksheet. First, let’s discuss some basic overhead costs incurred by any small business (be it soaping or clothing design or pottery throwing). These are things like heat, electricity, phone bills etc. Overhead costs are sometimes referred to as indirect costs or fixed costs. 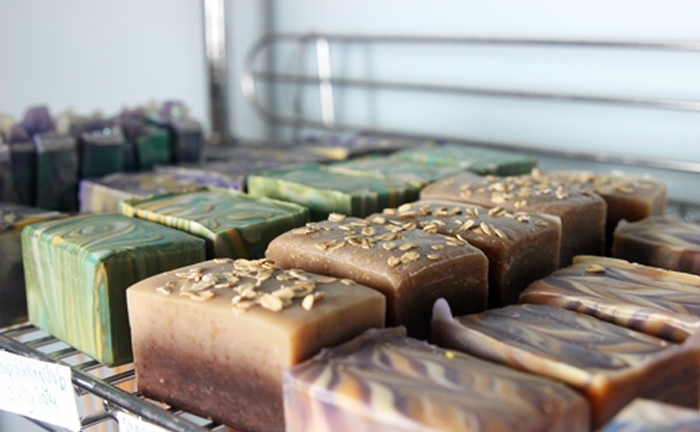 If you are like many small scale soapmakers, you work out of your own home or apartment. To get a true overhead cost for when you do get past the start-up phase, your soap company should be paying you rent (but for tax purposes, only if you’ve allocated a room solely for soapmaking). Generalizing greatly, renting a room will be $200 (Mortgage of $800 divided by 4). Next, you have your phone/internet bill, heating, electric, water, sewer and garbage. (NOTE: When figuring out your own cost analysis, use your own numbers). Some of indirect costs occur on a monthly basis like rent, phone and water. Indirect costs may also include costs that will vary from month to month, including marketing materials, design work, website maintenance. Because of this, your indirect costs may fluctuate greatly from month to month. For purposes of example, I’ve inserted some numbers which I believe are average for a month of soapmaking. This list includes fixed costs such as postage, pans, spoons, an extra burner, shelves etc. When we initially built our soap room in the Soap Queen lab, we added shelving, cabinets, a portable single-burner range, and bought new equipment. All together, this added up to about $400.00. Indirect costs include setting up your soaping area, or even renting out a separate space. This gorgeous setup belongs to Shana of Bathvs, click here to learn more about her business. Let’s not forget insurance! This is the an essential you should have before starting any soap business. On average, this will run about $20.00-$40.00 per month. If you’re looking for business insurance, this post is full of resources. In this case, I’ve also factored in soap making molds. If you prefer, you can factor the molds into the raw material cost (direct costs) but since they last longer than 1 use, it makes more sense to me to put it in here. Giving that ‘Extras’ category of $70 a month means you can replace things that break or wear out when you need to. After you’ve calculated the indirect business costs for the month, it’s time to move onto the material and labor costs. These costs are sometimes referred to as the direct costs. For many soapers, the direct cost of each batch of soap will vary. This is because each batch will contain different ingredients. The examples below use an easy recipe with a trinity of oils with one scent and one color. I’m going to assume that I’m using the 5 Pound Mold with Sliding Bottom, which holds 76 ounces of soap. Below is the recipe that will produce 76.67 ounces of soap. For this recipe, you would need about 2.5 ounces of Energy Fragrance Oil for a light/medium scent. You can use the Fragrance Calculator to find out how much fragrance or essential oil you need for your recipes. Now, let’s figure out how many bars are in one batch. This amount will depend on how large or small you cut your bars. Each loaf weighs 76 ounces. If I cut each batch into 3.8 ounce bars, I can get 20 bars from each batch. Now that I know how much of each ingredient I need to produce one batch of soap, I can calculate the cost per batch. But, this cost will vary depending on what size of ingredients you purchase. When you buy larger quantities of ingredients, the cost per pound/ounce is reduced. For example, most Bramble Berry fixed oils are sold in 1 pound, 7 pound and 35 pound options. With each size increase, the cost per pound/ounce decreases. For example, 1 pound of olive oil is $4.30. This breaks down to about $0.27 per ounce. The price per pound reduces when you purchase 35 pounds of olive oil; 35 pounds of olive oil costs $107.80, which breaks down to $3.08 per pound of olive oil, or 0.19 per ounce. Buying larger amounts of ingredients is more cost effective in the long run but costs more upfront. Let’s take a look at how the price per batch breaks down when you buy the ingredients in bulk sizes. The amount of colorant you need will vary depending on personal preference; for this example I estimated you need about 1 tsp of Sunset Orange Mica, which weighs about 0.1 oz. The chart also includes sodium hydroxide lye, which is not easily available in bulk sizes due to shipping/freight restrictions. The price of distilled water will vary depending on your source; 1 gallon of distilled water at Walmart is $0.88 so I calculated an average of $1. In the example above, if you buy all the ingredients at bulk pricing, the material cost for one batch is $13.71. If one batch creates 20 bars, this means I need to charge $0.69 per bar to cover my material costs. Now, let’s take a look at the cost per batch if you do not buy in bulk in the chart below. I’m still going to buy larger sizes of Energy Fragrance Oil which is 16 ounces, and the 7 pound bags of fixed oils. In this example, my cost per batch goes up to $16.38 and my cost for 20 bars is $0.82. Buying ingredients in bulk is more cost effective, but it may not be the right choice for your business. Buying in bulk is more expensive upfront. But, buying your ingredients on a batch by batch basis is not very cost effective for business. Buying ingredients in the smallest sizes (1 pound of fixed oils for example) increases the cost per ounce. If you are a hobbyist and don’t plan on making a profit, this isn’t something you need to be concerned with. Deciding how much of each ingredient to buy is a choice every small business owner must make. The main factor is how many batches of soap you can realistically produce and sell. 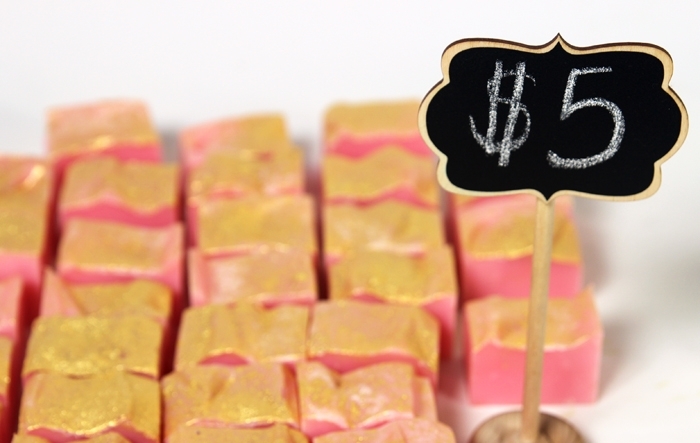 In the example of bulk ingredients and pricing above, you have enough fixed oils, colorant and fragrance oil to make 32 whole batches of soap. This means you will be able to produce 640 bars in (32 batches x 20 bars = 640 bars). Keep in mind you will need to purchase more lye and distilled water to produce this many batches. On the flip side, if you buy your ingredients in smaller sizes using the example above, you have enough oils to create 6 batches of soap, or 120 bars. If you sell 120 bars a month, the indirect costs and labor costs will increase the cost of each bar quite dramatically compared to if you are producing and selling 640 bars. In this example, the indirect costs this month are $420 (shown above). If you sell 120 bars that adds $3.5 to each bar ($420 divided by 120 bars equals $3.50). If you produce 640 bars, that adds $.65 per bar. Most soapy small businesses produce an amount of soap that’s somewhere in between these amounts. In general, buying in bulk and producing larger quantities of soap is more cost effective and results in more profit than buying and producing smaller batches. It’s also important to consider that fixed oils do have a shelf life. If you don’t think you’ll use that much oil within the shelf life, buying in bulk may not be the right choice for your business. You would hate for your oils to go rancid before you’re able to use them. The decision to buy in bulk may also be affected by the amount of storage space you have for ingredients.You also need to consider your shipping costs for the materials. One method of factoring in shipping costs (as explained by Lela Barker in this blog post) is to look at your invoices and determine the average percentage of your shipping costs, then factor that into your cost calculation. Labor also figures into this equation. How much do you want to pay yourself? $6 per hour, $15 per hour? For this example, we will use $15 per hour which is a healthy hourly wage (especially since the satisfaction of being self employed makes many want to work for themselves for free!) For this example, we will use 30 minutes to prepare the raw materials (scoop, measure, and make up your recipe). The amount of time to make the soap will vary, but let’s give ourselves 15 minutes of soaping time and 15 minutes of clean up. That’s a total of one hour per batch of soap. In this example, each batch creates 20 bars. That means the labor costs per bar of soap is $.75. Do keep in mind this is a very simple way of calculating labor costs. Don’t forget to pay yourself when working on your website, packaging your bars, making sales calls, answering emails, etc. Don’t forget to pay yourself for all that hard work! This should include time creating soap as well as answering emails, or working on your website. Now, let’s add all our costs together. Our direct material costs to produce the bar are $0.69 per bar when buying in bulk. The labor cost per bar is $.75. The indirect costs for the month were $420. If you were to sell all 640 bars that you produced, the indirect costs add $0.65 per bar of soap. On the flip side, let’s break down the cost if you were to buy your ingredients using non-bulk pricing. With this example, you are able to create 6 batches of soap which creates 120 bars. The indirect costs for the month were $420. If you were to sell all 120 bars that you produced, the indirect costs add $3.5 to each bar. As you can see, selling 120 bars vs. 640 bars per month greatly affects your profit on each bar due to your overhead. Most soapy businesses will produce and sell a number somewhere in between these amounts. So, let’s look at one more example! Let’s assume you purchased your ingredients using bulk prices. But, you only produced and sold 360 bars of soap which is 18 batches of the recipe above. You will have plenty of ingredients left over for next month. The indirect costs for the month stay the same ($420). If you created and sold 360 bars, your indirect costs would add on $1.17. Once you know how much you need to charge per bar to break even, you can decide how much you’d like to add onto the price to get a profit. But how do you find out what the final price should be? How much profit you’d like to receive from your products is ultimately up to you. There are several different pricing strategies, as described by Lela Barker of Lucky Break Consulting in this blog post and listed below. Whatever strategy you choose, I recommend staying consistent. The Multiplier Strategy: This strategy involves multiplying your costs by a specific value to get your final price. The Percentage Strategy: This strategy involves multiplying your costs by a percentage to get your final price. The Fixed Amount Strategy: This strategy involves adding a fixed amount to every item to reach your price. If you’re a business owner, you know the importance of carefully tracking your costs and profits. It can be time consuming and tedious. But, I’ve seen small businesses fail because they underestimate the hidden costs of business. Before you jump in head first, I recommend carefully tracking your estimated costs. Be in control of your business; don’t let your finances surprise you. And remember to hustle! I hope this post helped outline the various cost categories, and will help you price your products in a way that takes all the costs into account. If you’re thinking about getting your business underway, the Business in a Box Kit includes everything you need to get started, including ingredients to create bars for less than $1.40! Copyright © 1999-2017 Bramble Berry ® Inc. All Rights Reserved.